I have a fun new bracelet tutorial for you today! 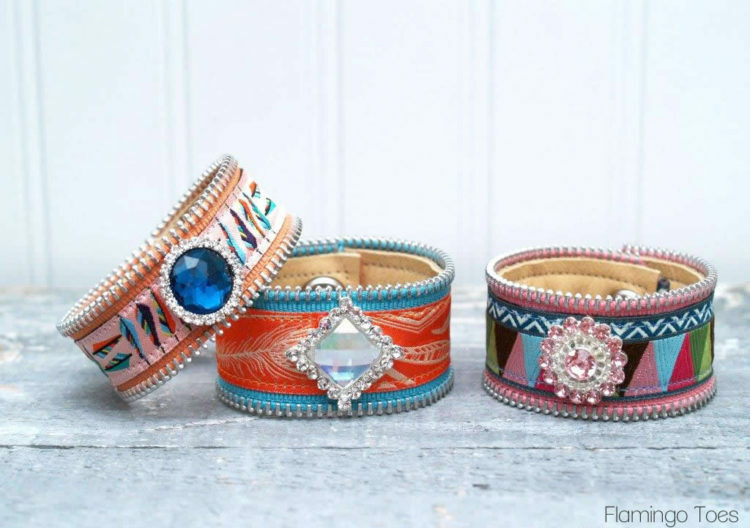 These pretty ribbon and leather bracelets go together really quickly – and you can make them in lots of fun combinations of beads, ribbon and zippers! The gorgeous ribbons are from The Ribbon Retreat. I’ve been dying to do a project with them for a while – especially the Amy Butler and Ana Maria Horner lines. I just knew they’d be perfect for jewelry – well, they’re pretty perfect for anything. 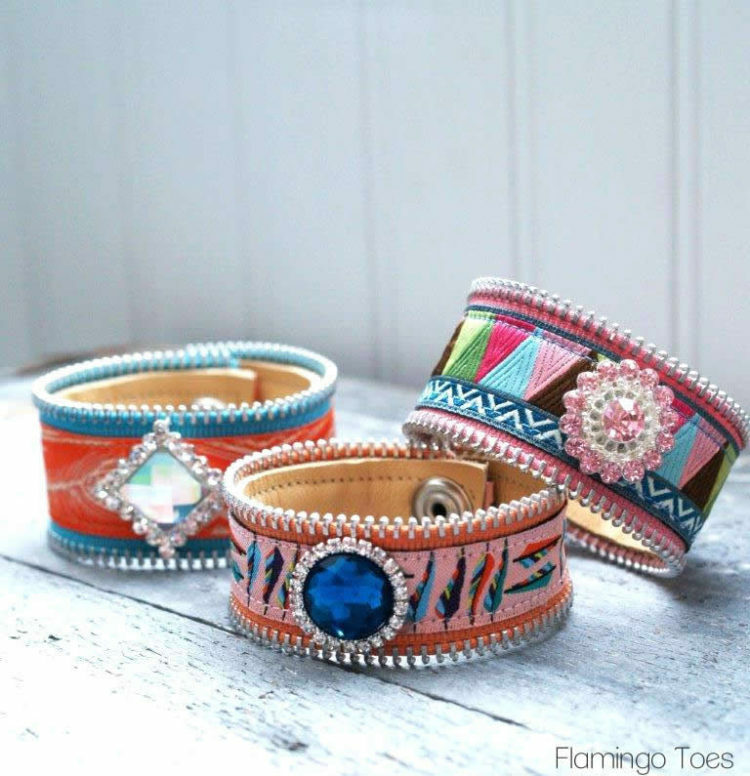 But the colors and designs make up great bracelets! Begin by cutting out your leather and zipper pieces. You’ll want the zipper pieces just a little shorter than the leather piece. 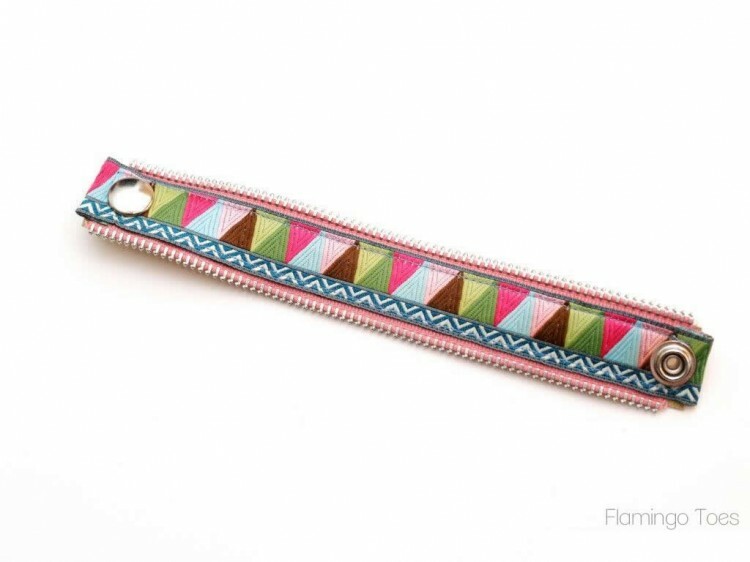 I cut my leather 8 1/4″ x 1″ for this bracelet. Cut two lengths of fusible tape just a little shorter than the zipper pieces. Lay a piece of fusible web on the wrong side of the leather. Lay the zipper pieces over this and press down lightly. Cut another piece of fusible tape and lay over the zipper pieces. Cut your ribbon about 9″. Lay it over the fusible tape and fold the ends under to hide the raw edges. Press lightly again. This will help hold the ribbon and leather in place while you sew. Using a leather needle on your machine, sew the cuff together all the way around, just inside the leather edge. I found that the piece went through the machine much easier with the leather facing up. Add your snap pieces to each end of the cuff, according to the snap instructions. 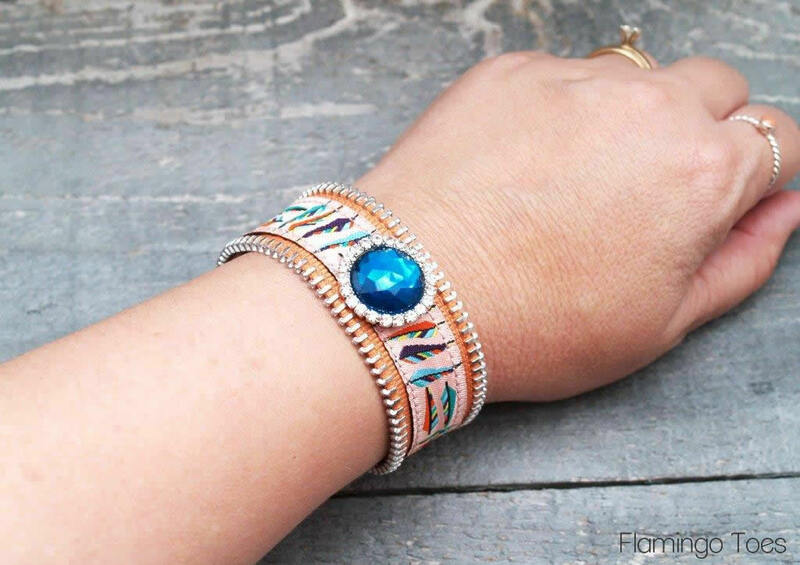 Now glue on your little beaded gem in the center of the bracelet. I used E-6000. Allow to dry at least 12 hours – 24 is better, and place something heavy on the gem to hold it tightly to the cuff. You want that gem glued on as tightly as possible before you start curving the cuff to wear it. And that’s all there is to it! 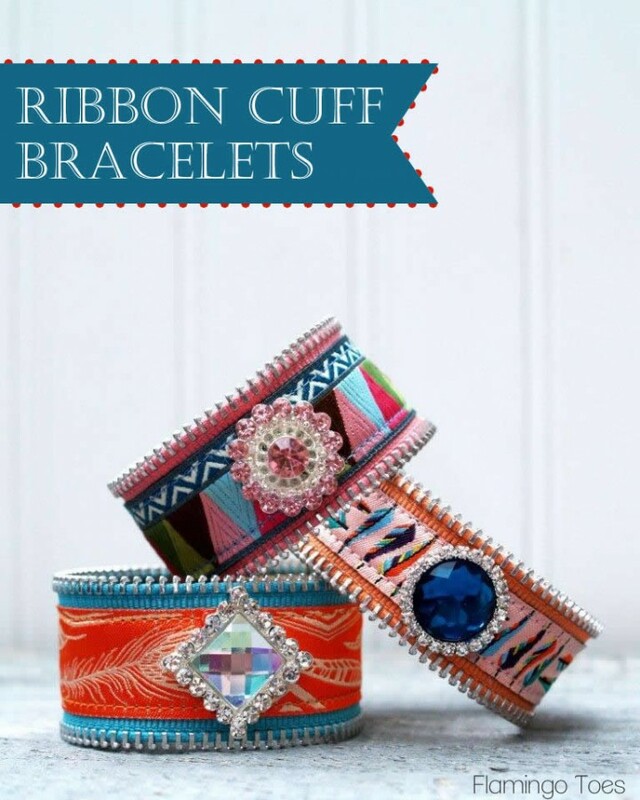 You can make these up in fun color combinations! 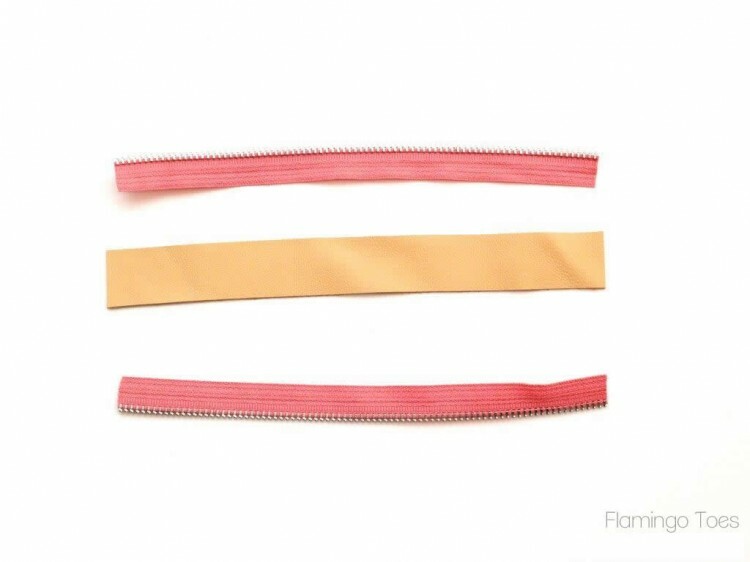 With the narrower ribbon you’ll want to cut your leather piece to fit the width, and also trim the zipper tape so that it doesn’t overlap. So fun. Linking up at Sunday Scoop, Today’s Creative Blog, Met Monday, Tutorials & Tips Tuesday, Shabby Creek Cottage, My Repurposed Life, 504 Main, Everything Etsy, and the other fabulous parties on the party page. Make sure you check them out! 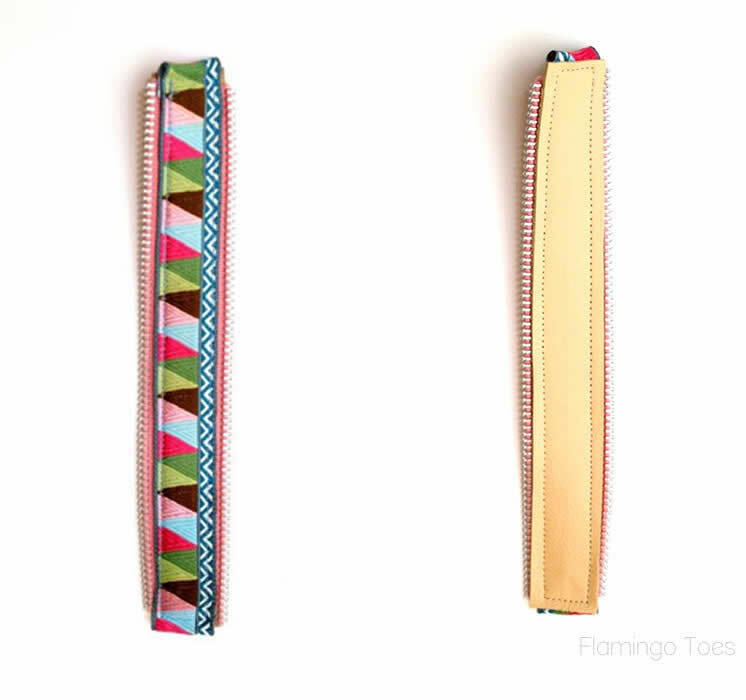 I love these Bev, brilliant to use the zipper trim, so fun! 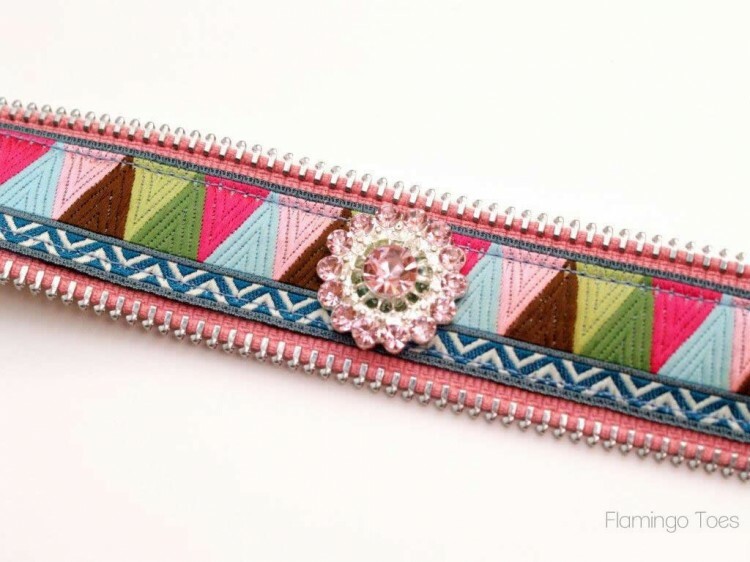 I love the way this bracelet turned out and it seems fairly easy to make! Gorgeous! These are so unique Bev! I just love them. Bev I love these. And they look so easy to make. Gorgeous. I love these! You always come up with the most awesome jewelry tutorials! These are brilliant! I think you have out “Anthropologied” Anthropologie… they are probably visiting your blog for jewelry ideas now! 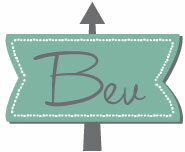 Oh, Bev, these are SO cute! I am loving those ribbon designs. 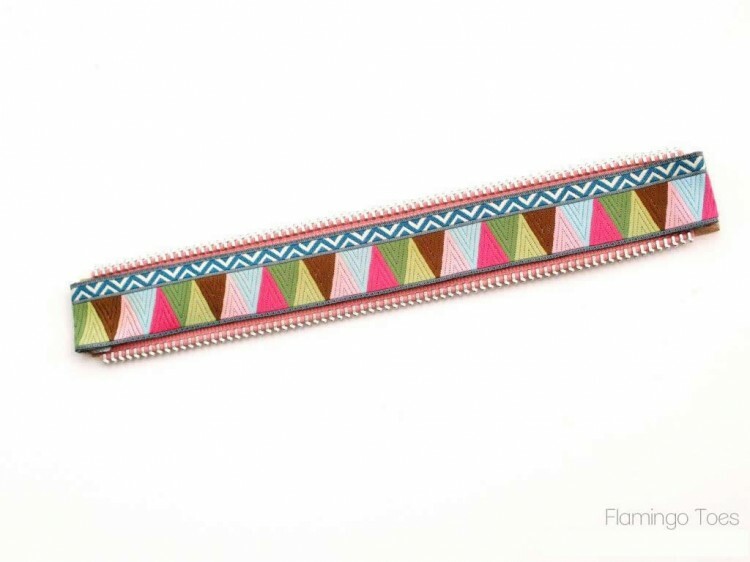 And these bracelets are so on trend right now! 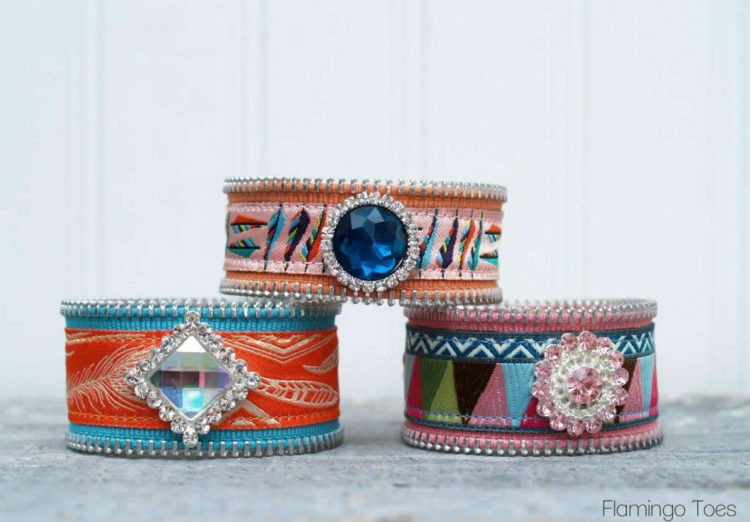 Oh Bev, these are gorgeous bracelets! Looks so professional! Totally look like something I’d see in Anthropologie! Pinning these most definitely! Love these Bev! Aunts, nieces, and grandma do a craft together when the family gets together for Thanksgiving. I’ve been looking for a while for this year’s project, and I’ve found it. This is perfect! Thank you. 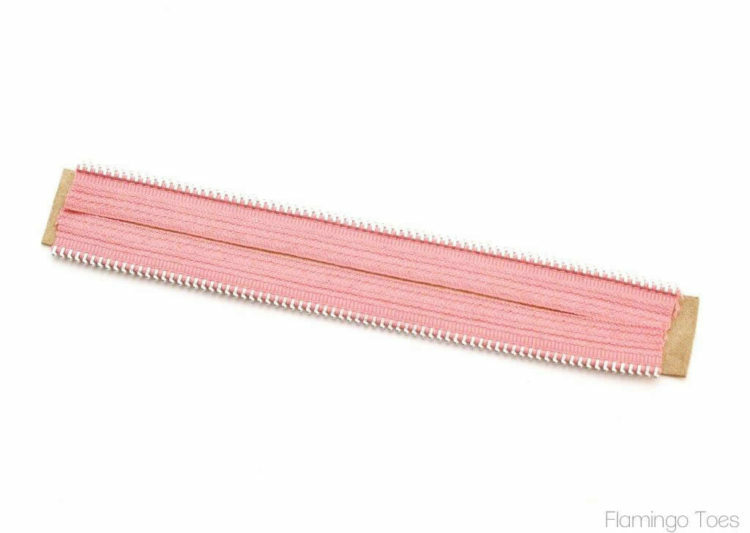 Where do you find the leather ribbon? Or what’s it called? I can’t find it when searching. Thank you. Shelley the leather was cut from a leather scrap I have, I didn’t buy it from The Ribbon Retreat. 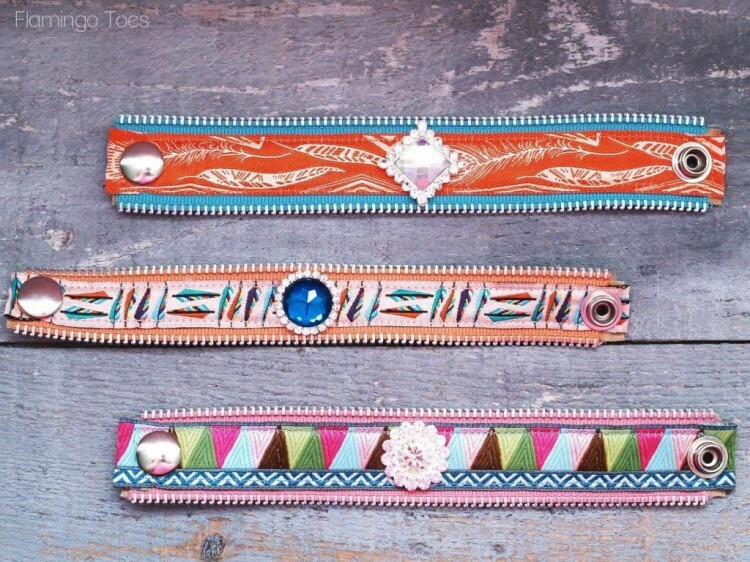 You can find leather scraps online at several stores and at Etsy and Ebay too. Hope that helps!